Spend two action-packed days learning about the newest advances in psychopharmacology and contemporary trends in medication management. From her unique perspective as a prescribing clinical psychologist, Caroline teaches psychopharmacology thoughtfully, with an emphasis on the experience of the client. Caroline's extensive 17 years of experience in mental health and passion for her clients shine through in the detail and thoroughness of her presentation. Clients often only have a few minutes with their prescriber and require additional support. It is vital that you are able to answer their questions, help manage side effects and understand drug reactions. This training, designed for counselors, nurses, psychotherapists, psychologists, and other mental health professionals, provides the information you need in order to best help your clients. This conference allows time for exploration of underrepresented areas, including ADHD, chronic pain, sleep, eating, and substance abuse disorders. Take home specialized guidelines for geriatrics and pregnant or nursing women. 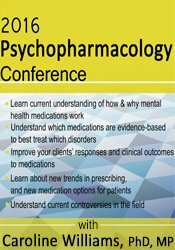 Discuss how the DSM-5® may impact prescribing patterns and the use of psychotropics in newly defined diagnoses. In addition to a general "nuts and bolts" review of medications, you will examine case examples, discuss medication controversies and learn the "inside scoop" about newly released medications. Caroline's engaging style makes her an excellent teacher. She uses metaphors from daily life to illustrate complex neurological and psychological concepts. Her vivid, down to earth teaching approach generates an easy guide for providers. Her presentation includes many take home points that you can use to teach your clients about mental illness, and how medications work. Update your psychopharmacology knowledge, and discover why attendees rave about Caroline, with comments like, "Wonderful presenter and teacher," and, "Extremely knowledgeable presenter who was very collaborative with the audience." Describe how mental health medications work. Explain how medications are chosen for mood disorders and specific patient characteristics. Define the actions, therapeutic uses, and side effects of antidepressants. Identify and overcome barriers that block your clients’ success with their medication. Discuss options for clients with treatment resistant mood disorders. Identify the actions, side effects, and therapeutic uses of antipsychotic medications. Describe use of complementary and alternative agents for treatment of mental illnesses. Discuss medication treatment options for ADHD. Define medication management of sleep disorders. Identify medications effective with eating disorders. List medication treatment options for substance use disorders and discuss how to effectively incorporate medication assisted treatments into an overall plan for care. Describe the interaction between women's and men's' hormone levels and their mental health. Distinguish the unique medication considerations for geriatric clients. Controversy regarding antidepressants and placebo- Who to treat when? When to prescribe for clients with dual diagnosis? New Trends: Genetic Testing and more? Caroline Williams, PhD., MP (medical psychologist), is a clinical prescribing psychologist in New Mexico. She has experienced psychopharmacology from both sides; as a provider referring patients for medication management, and for the last five years as a prescriber. Currently she provides medication management services in private practice, and for The LifeLink, both in Santa Fe, NM. She has worked as a clinical psychologist for more than 19 years. Her practice has included psychological evaluation, psychotherapy, consultation, forensic work, and training. Financial: Caroline Williams maintains a private practice. She will address various medications during her seminar. Dr. Williams receives a speaking honorarium from PESI, Inc. Non-financial: Caroline Williams has no relevant nonfinancial relationship to disclose. For U.S. and Canadian customers, a CE test is available for $19.99 USD per participant. International CE rates may vary; please contact our Customer Service at 1-800-844-8260 for more details. Nurses completing these self-study materials will earn 12.6 contact hours. Expires: 7/28/2019. Iowa Nurses: PESI, Inc. is an approved provider by the Iowa Board of Nursing. Provider #: 346. Nurses successfully completing these self-study materials will earn 15.2 self-study contact hours. This self-study program offers 760 instructional minutes of pharmacology content which is designed to qualify for 12.5 contact hours toward your pharmacology requirement. PESI, Inc. is accredited by the Accreditation Council for Pharmacy Education as a provider of continuing pharmacy education. Successful completion of this Knowledge-based self-study program qualifies for 12.5 self-study contact hours. ACPE Universal Program Number: 0289-0000-14-032-H01-P. You are required to successfully complete a program evaluation/post-test in order to receive a statement of credit. This self-study activity consists of 12.5 clock hours of continuing education instruction. Credit requirements and approvals vary per state board regulations. Please save the course outline and the certificate of completion you receive from this self-study activity. Contact us for more information on your state board or organization specific filing requirements. American Psychological Association credits are not available. Canadian Psychologists: PESI, Inc. is approved by the Canadian Psychological Association to offer continuing education for psychologists. PESI, Inc. maintains responsibility for the program. This program is approved for 12.5 self-study continuing education hours.